Who's up for some '70's prog rock? Most people who say that they like Yes, really only mean that they like three to four songs. Rarely do I hear from somebody that knows more than Roundabout, Long Distance Runaround, All Good People/Your Move and 1983's Owner of a Lonely Heart. It really is a rarity to meet a person that would not skip over songs or just turn the music off. However, I get it, Yes can be an acquired taste and hard to get through for some people. To others though, the progressive experimental rock of Yes can be a rewarding experience for the body, mind and soul. Outside of their most well known songs, I didn't know a great deal about Yes. I was on the receiving end of many lessons back in my early teen years while working at Redamak's where only classic rock was allowed to be played in the kitchen. The radio station of choice at the time was 105.9 WCKG out of Chicago. This is when and where I started hearing more of the deep tracks from Yes and also began to develop a much greater understanding and appreciation of the work that went into creating music. Relayer is a musical journey. Side one is entirely taken up by a single composition, The Gates of Delirium which clocks in at almost twenty-two minutes and is based on Leo Tolstoy's novel War and Peace. The last six minutes of this musical epic, also known as Soon, was released as a single in January of 1975. As I mentioned before, some people would listen to this and think of it as noise. Well, in a sense that is true because the band would go to junkyards and buy parts of cars and hang them on a rack to use as percussion. While recording, percussionist Alan White pushed the rack over and it was decided to keep the crash in the song, it's one of my favorite moments of the song. Side two consists of only two songs, Sound Chaser and To Be Over. Both songs run at over nine minutes. In Sound Chaser, an almost entirely instrumental piece, you get a celebration to music itself and Steve Howe offers up some of his finest guitar work in To Be Over. 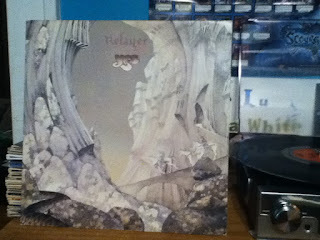 Relayer was not initially received well after the band's previous album, Tales from Topographic Oceans, but still became a success. The album reached #4 in the UK and stayed in the top forty for eight weeks. While in America the album remained in the top 200 albums for sixteen weeks and managed to reach up to #5, but is still considered one of the band's most underrated works. I want to give thanks to Reed Sturdivant of Johnson City, Tennessee who gifted a couple albums to me in a secret Santa gift exchange at the Comic Geek Speak forums. Relayer was one of them I'm extremely happy to have it as part of my collection. Thanks Reed!